Larger than life? No worries, pretty lady!! We have some formal wear for you. ! Three colors--red, gold, and blue. The models are showing the fronts of each dress. A view of the red and blue dresses. Now for the important stuff--how do I get these in my game?? How do I get them to work? Where did this mesh come from? If I download your file will I have a "fat lady?" Many years ago one of the members of our community know as Martaxl made a few meshes for the "Fat Lady." This body type is pictured above. She once had a website but that is long gone. 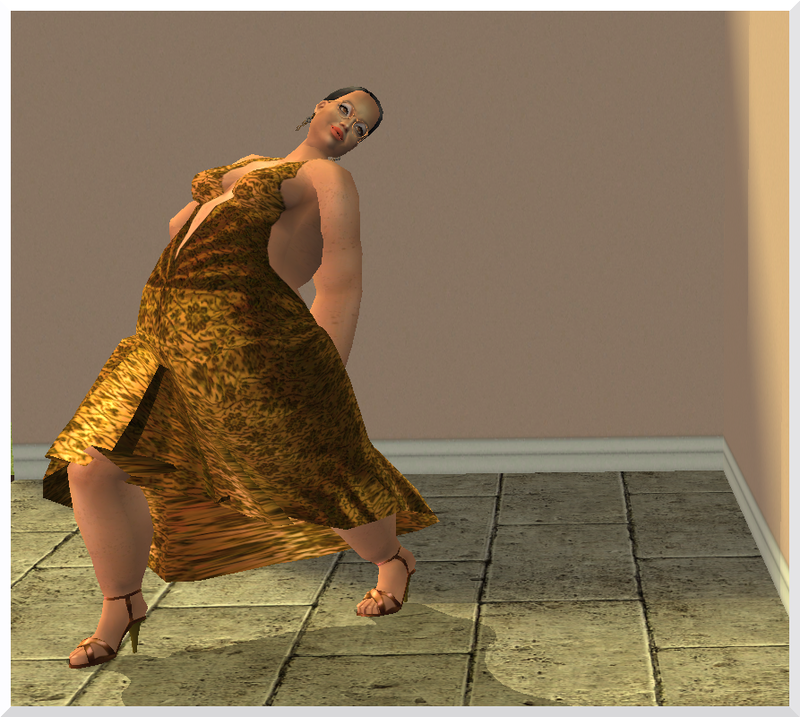 If you search her name here on Mod the Sims (in the Sims 2 section) you can read more about her and links to her other meshes/recolors and ones other people have done throughout the years. Her policy states on MTS 2 that "Feel free to recolor and publish anywhere you want to, but please don't forget to link back to my meshes." So all thanks go to both Martaxl and Gothplague. Please respect their policies and do not claim as your own or upload on any paysites. This dress is base game compatible. In order to get these recolors in your game you need to go to http://www.woodensimolean.com/GothplagueMartaxlWomen and download and unzip the mesh called mesh_gothplague_af_martaxl_fishtaildressheels11072007. It's the first one listed. When you unzip it in your downloads, you will get the mesh you need. Also unzip the dress that is labeled amethyst velvet. I did not make the textures. I simply recolored the purple/amethyst textures blue, red, and gold. Don't forget you also need to download my recolors and put them in the downloads file as well! The mesh for the Bigger Lady has some issues (Sims arms will sink into the body). There is some distortion. Unfortunately some of the bigger Sims have these limitations. Let's hear it for the big Sims ladies out there who want to look beautiful at birthday parties, weddings, graduations or just hanging around the house! If you have any issues, comments or questions, please feel free to PM me. I've been a member of Mod the Sims for many years and enjoy helping as well as encouraging people. My policy is....just enjoy these items and have fun with them. PLEASE BE RESPECTFUL in the comments. 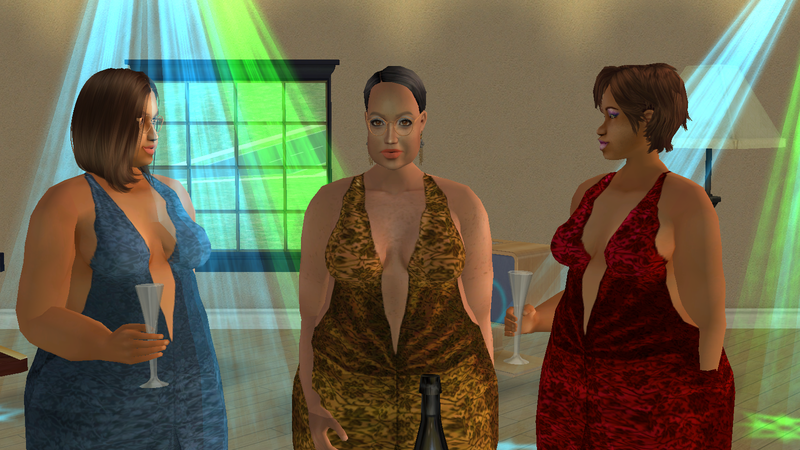 We all know people come in different sizes and yes, even in the Sims World some of us like different body types. If you like them, it would be nice if you hit "thanks." Yeah, I get a kick out of your comments. They encourage me to keep coloring and creating. I'd like to thank my Sims models--Carmen, Faye, Cindi, Melody--and the poor Nancie-- who got crushed by a satellite during the photo shoot! Please unzip all into your downloads folder or wherever you keep your CC. The original dress color I recolored is PURPLE. Thank you to Gothplague and Martaxl. 20 people have said thanks to HCAC for this download.